ZAMBOANGA CITY, Philippines (Mindanao Examiner / Mar. 14, 2011) – Four provinces and one city in the southern Philippines have been chosen as semi-finalists to the top post of “Best eLGU Website” at the prestigious 12th Philippine Web Awards (PWA). The five are the governments of Sulu province in the Muslim autonomous region, Del Carmen municipality in Surigao del Norte province, Lanao del Norte, Padada municipality in Davao del Sur and Zamboanga City. Manila city is the sixth semi-finalist in the search for best local government portal. Two awards will be given out for each category, the Best Website and the People’s Choice Award, the voting of which has officially started. 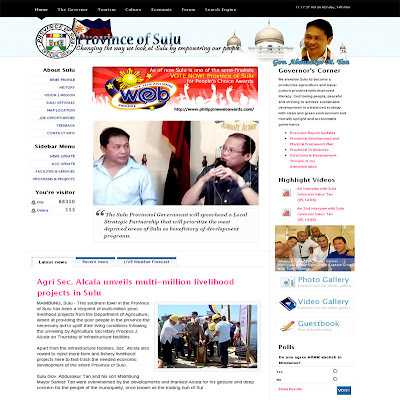 “We are working really hard to catch up with the advent of technology and through our website, we are able to inform not only our people, but the whole world about the good province of Sulu and its achievements not only in governance, but a lot more which reflects our rich culture and colorful heritage,” said Sulu Governor Sakur Tan. The PWA is the most prestigious award giving event in the Philippines and over 1000 entries are joining each year. This will be very beneficial for the Sulu website because it is a well-known national event and is recognized by the entire IT (Information Technology) community. The People’s Choice Awards is now open for voting and can be accessed on this URL: http://peopleschoice.philippinewebawards.com. A voter can choose favorite in all the 12 categories, but can only vote for one semi-finalist for each category. The awarding will be held on April 8 at the Carlos P. Romulo Auditorium, RCBC Plaza in Ayala Avenue in Makati City. The PWA is an award-giving body that annually recognizes the best Filipino-created Web sites and honors the individuals and teams behind them. The PWA continues to attract participants here and abroad and gain support from major industry players. Over the years, the PWA honors outstanding Filipino talent in the field of Web design and development. The finalists and winners not only garner appreciation from their peers, but also career growth and bigger opportunities.